My book, “Perpetuating American Greatness After The Fiscal Cliff”, proposes changes in the federal corporate income tax laws that will encourage our international corporations to STEP UP and invest, risk free, a portion of the $2 trillion parked overseas, in state transportation infrastructure construction projects. They will do so by purchasing a new type of tax-exempt bonds offered by our states that will be called Jump Start America Bonds. The sale of such bonds to finance shovel ready state transportation infrastructure construction projects will generate the perfect economic stimulus. Hundreds of thousands of good tax-paying jobs will be created. Corporations investing in Jump Start America Bonds will be able to repatriate to the US billions of dollars of cash, held offshore for tax reasons, at highly discounted tax rates, and without risk of loss. If they prefer they can treat the investment in Jump Start America Bonds as having been made and remaining offshore and only pay a repatriation tax on the interest received. Five years after issuance the transferable bonds may be repatriated at the discounted tax rates and used at face value plus accrued interest to pay any federal corporate income taxes. Corporations will alternatively be able to STEP UP and promote the economic stimulus by floating their own bond issues domestically at the currently low rates and investing the proceeds in Jump Start America Bonds. Corporations will profit from the interest rate spread and will be able to use the proceeds from the Jump Start America Bonds to repay their bonds when the principal becomes due. Wealthy individuals will also be able to STEP UP and purchase Jump Start America Bonds without risk of loss because the bonds will be usable at face value plus accrued interest to pay federal estate taxes (like previously issued “Flower Bonds”). A corporation providing the major portion of the funding of a bridge or tunnel might acquire naming rights during the term of the Jump Start America Bonds that finance a project. The federal government will see a surge in tax revenues from the taxes which will be paid, even at reduced rates, from the repatriation of offshore profits, and from the income taxes payable by the contractors building the construction projects and their employees. Welfare and unemployment benefits will decline. The federal deficit and the rate of growth of the National Debt will be reduced. The multiplier effect will create tens of thousands of additional jobs and generate billions of additional federal and state income tax revenues. The housing and auto industries will benefit from the creation of middle class jobs. The US government’s accepting Jump Start America Bonds, if they are tendered in payment of corporate or estate taxes, will act much like QE. The Jump Start America Bonds will ultimately be converted into cash as interest payments are made and when they mature. The tax law changes recently proposed by President Obama as part of his “grand bargain” are merely a slightly different form of tax and spend legislation he has previously proposed. He would reduce corporate tax rates, but increase net tax revenues by eliminating deductions and adding a tax to confiscate a portion of the $2 trillion held overseas by US corporations to legally avoid the unfair tax upon repatriation. The “grand bargain” is dead on arrival. By way of contrast, changing the US corporate tax laws to enable the sale of Jump Start America Bonds will encourage our rich corporations to finance transportation infrastructure construction of the type which President Obama has suggested. We would expect that our corporations would choose to invest in projects likely to generate the revenues to fund the carrying costs of the Jump Start America Bonds. On the other hand we would expect President Obama to spend, as he previously did with DOT funds, on projects in states where Democratic candidates would benefit in the upcoming 2014 elections. This entry was posted in economic stimulus, economics, federal deficit, federal estate tax, government stimulus, income tax, jobs, macroeconomics, middle class, National Debt, transportation infrastructure, Uncategorized, unemployment and tagged economy, government, transportation on July 20, 2013 by sjfeconomics. 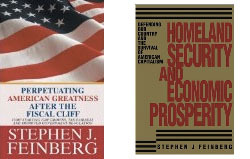 My book Perpetuating Greatness After The Fiscal Cliff introduces Jump Start America Bonds. The proposed changes in the federal corporate income tax and estate tax laws which would make the sale of Jump Start America Bonds possible would create the perfect economic stimulus. Why do I reach that conclusion? 1. The sale of Jump Start America Bonds to finance shovel ready state transportation construction projects will create hundreds of thousands of tax-paying jobs and help the middle class. 2. By investing in Jump Start America Bonds corporations will be able to repatriate to the US billions of dollars of cash held offshore for tax reasons at highly discounted tax rates and without risk of loss. If they prefer they can treat the investment in Jump Start America Bonds as remaining offshore and only pay a repatriation tax on the interest received. 3. Corporations will also be able to STEP UP and promote the economic stimulus by floating their own bond issues at the currently low rates and use the proceeds to invest in Jump Start America Bonds. Corporations will profit from the interest rate spread and will be able to use the proceeds from the Jump Start America Bonds to repay their bonds when the principal becomes due. 5. Wealthy individuals will be able to STEP UP and purchase Jump Start America Bonds bearing tax exempt interest and without risk of loss from interest rate increases or investment loss (like previously issued “Flower Bonds”) by using the bonds to pay federal estate taxes. 6. A corporation providing the principle portion of the funding of a bridge or tunnel will acquire naming rights during the term of the Jump Start America Bonds which finance the project. 7. The Jump Start America Bonds will be transferrable. 8. Our debt laden states will be able to finance their needed transportation projects on favorable terms. 9. The federal government will see a serge in tax revenues from the taxes which will be paid (even at reduced rates) from the repatriation of offshore profits and from the income taxes payable by the contractors building the construction projects and their employees. Welfare and unemployment benefits will decline. The federal deficit and the rate of growth of the National Debt will be reduced. 10. The multiplier effect will create tens of thousands of additional jobs and generate billions of additional federal and state income tax revenues. 11. The housing market will benefit from the creation of middle class jobs and economic growth. 12. The federal government will generate the economic stimulus with no cash outlays. 13. Accepting the Jump Start America Bonds if they are tendered in payment of corporate or estate taxes will act much like QE. The Jump start America Bonds will ultimately be converted into cash when they mature. This entry was posted in economic stimulus, economics, federal deficit, federal estate tax, government stimulus, income tax, jobs, macroeconomics, middle class, National Debt, tax fairness, transportation infrastructure, Uncategorized, unemployment and tagged estate tax on May 19, 2013 by sjfeconomics.